Join together and battle to decide the fate of the galaxy like never before in the new United Forces update – now live in Star Wars™: The Old Republic™! 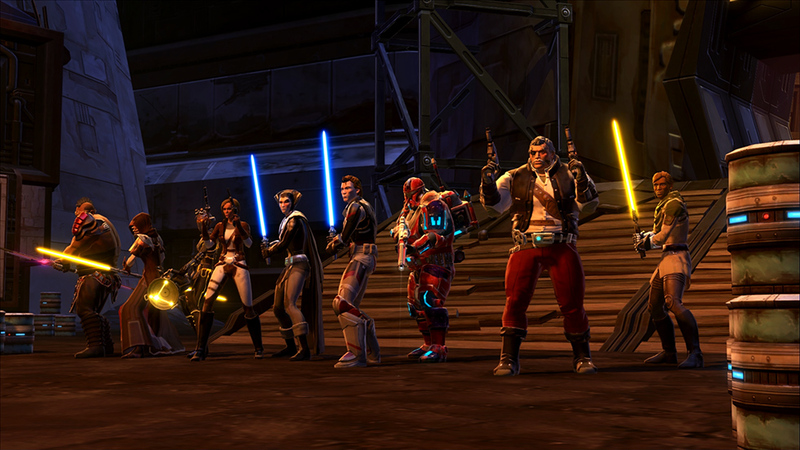 With the United Forces update, we’ve united players into five new servers, expanding your connection to a galactic-sized community so you can join and reconnect with friends, discover new guilds and jump into multiplayer battles more easily. Simply log in to play to get the new Mini Mogul NM-1 Mini-Pet, a miniaturized version of the battle walker employed by Supreme Mogul Karagga the Hutt in the infamous “Karagga’s Palace” Operation. Earn the merciless Darth Hexid Companion who delights in crushing all opposition when you complete three PvE or three PvP missions through Group Finder by the November 27th deadline. Unlock the new ‘United Forces Group Recon’ achievement when you complete three PvE Group Finder activities and get the new ‘United Forces Warzone Recon’ achievement when you complete three PvP matches through Group Finder. Plus, enjoy a full week of Double Rewards: Double XP, Double Command XP, and more through November 16! NOTE: All achievements are unlocked in-game as earned. The Mini Mogul Mini-Pet and Darth Hexid Companion are delivered via in-game mail on November 28, 2017. Don’t miss out on these special limited-time rewards and be sure to check out the FAQs for more details about this update. Gather your allies and join the battle now!